Our dedicated, professional staff is committed to providing the safest and most outstanding customer service in animal removal, control and maintenance. We have been servicing commercial and residential areas in termite control and any pest and lawn care needs since 1975. Our staff is dedicated to going the extra mile, ensuring quality and reliable service, setting us apart from our competition. Bug Out Pest Control is mid-Missouri’s premier pest control business! At Bug Out Pest Control our team of dedicated and expert pest control technicians are committed to providing the safest and most outstanding customer service in animal removal, control and maintenance. We have been servicing commercial and residential properties in mid-Missouri since 1975. With over 40 years of experience, you can trust your home or business’ termite control, bed bug, pest and lawn care needs with Bug Out. Not only do pest infestations bug you, but the could cause serious damage your to home’s structure and safety. One of the most common and most irritating pests are bed bugs. These little critters cause lots of issues inside the home, but also follow you outside the house. BED BUGS: A parasitic insect which feeds exclusively on blood. The name ‘Bed Bug’ comes from the preferred habitat for the insect – warm homes, especially near beds or bedding. Although they’re called bed bugs, these pests do not live in only beds. Your home’s baseboards, carpeting, sofas and other furniture are all posh resorts to bedbugs, and at night they come out to dine on your blood, an all-you-can-eat buffet to them. Bed bugs are hard to see, as they’re only 4 – 5 millimeters long. So, the average bed bug is the size of an apple seed. They are a reddish-brown insect and their bodies are flat. 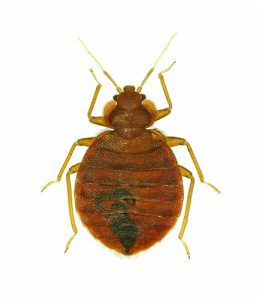 BED BUGS ARE VISIBLE: This may sound obvious, but these little critters are good at hiding and only like to come out when their host is asleep. Take a look around your mattress, especially the seams, Bed Bugs like to hide in small crevices and cracks. BED BUGS SHED THEIR SKIN: Look for small case skins or sheds around your mattress, couch or in the carpet. BED BUGS LEAVE STAINS: If you notice black or brown stains, begin to look around for the bed bugs in the seams of your mattress. BED BUGS BITE: If you notice little red, itchy bumps on your skin, it could be bed bug bites. IF YOU EVER WAKE UP WITH ITCHY OR BRUISED SKIN, YOU MAY HAVE A BED BUG PROBLEM WITHOUT EVEN KNOWING IT. Fortunately, a bed bug problem is entirely controllable under professional care. Using state-of-the-art equipment and techniques, Bug Out’s licensed exterminators will inspect your home’s environment and construction to identify the problem and determine the best course of action. At Bug Out Pest Control, we are committed to providing quick, affordable and, most importantly, effective solutions to your bed bug pest problem in central Missouri. Our team takes every measure to protect you and your family’s safety throughout the extermination process. For more information or to schedule a free inspection and consultation, please contact us today! DID YOU KNOW? Female bed bugs can lay up to five eggs a day and 500 during a lifetime. Don’t wait – call Bug Out Pest Control today, before your small problem becomes a big one. WHETHER YOU SUSPECT YOU HAVE A BEDBUG PROBLEM OR JUST WANT TO MAKE SURE YOU NEVER GET ONE, WE HAVE THE EXPERTISE & TRAINING TO GET RID OF YOUR UNWANTED HOUSE GUESTS FOR GOOD.